The first ever Yu-Gi-Oh! TRADING CARD GAME Speed Duel Tournament Pack is coming to Official Tournament Stores near you! This pack brings foil upgrades of cards legal for Speed Dueling! As Duelists compete, they can collect Super and Ultra Rare cards for their Decks. The Yu-Gi-Oh! TRADING CARD GAME Speed Duel Tournament Packs are used as participation prizes or tournament prizing for Duelists entering local tournaments. Yu-Gi-Oh! 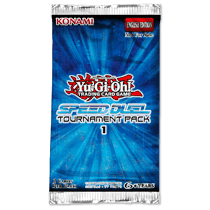 TRADING CARD GAME Speed Duel Tournament Packsare not-for-sale items and are only provided EXCLUSIVELY to Konami’s Official Tournament Stores. Yu-Gi-Oh! TRADING CARD GAME Speed Duel Tournament Pack 1 has a bunch of foil upgrades for popular Speed Duel legal cards! You can make your best Kaiba impression with a blinged-out Blue-Eyes White Dragon, or perhaps you would prefer to draw cards in style with Super Rare copies of Wonder Wand, or maybe you would like to Ritual Summon the powerful Relinquished as an Ultra Rare? Only by competing at your local OTS will you have a chance to collect these foil upgrades for your Speed Duel Decks! Each Yu-Gi-Oh! TRADING CARD GAME Speed Duel Tournament Pack contains 2 foil cards.